Thanks to American Express, the concept of Small Business Saturday on Thanksgiving weekend is getting to be as well known as Black Friday and Cyber Monday. And although one of the main purposes of SSS is to encourage consumers to use American Express cards — and to have more small businesses accept them — this promotion of the virtues of “shopping small” has been a huge boon to independent retailers. With this year’s date only a month away, it’s a good time to plan some activities to draw shoppers to your store, or shopping district. Although American Express will provide marketing materials and national advertising, this year they are not offering a statement credit offer for card members. 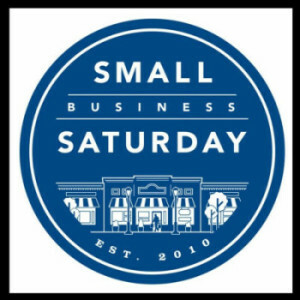 Instead they are “increasing the support and resources we provide to help small business owners market the day within their communities and truly make it their own.” You can access these materials on the Shop Small site, and also get ideas from the Small Business Administration’s SSS page. We’ll miss the incentive of a statement credit (which in 2012 gave customers back $25 if they spent $25 in a small business, a very generous offer). But this move does even the playing field for businesses who wish to promote the day, but don’t accept American Express. All of the marketing materials are available to these businesses, with the exception of appearing on the Shop Small map and some merchandise such as free doormats. Our business association has registered as a group, so we received these supplies to distribute to everyone who is interested. We will also use the logos and suggested posts in our social media, encouraging shoppers to come to our area. Even if you aren’t part of a group, you could promote the event, and shopping at your store, on Facebook and Twitter (and don’t forget that you can share postings from American Express’s Facebook page for the event). Use the hashtags #shopsmall and #smallbizsaturday to be part of the larger conversation. And don’t forget to include some of the statistics about why shopping small is good for our communities. Let’s all keep the “shop small” conversation going!